"As she readied the specially forged katana, its sharp edge was shadowed for a moment, revealing the choji pattern, the dragon teeth that gave the katana its name." Legend of the Five Rings: The Card Game is more than a game—it's an experience. With its strategic and tactical gameplay, its evocative art, and its subtle ebb and flow, Legend of the Five Rings transports you to the mystical realm of Rokugan. Here, samurai battle with steel blades, courtiers master the subtle intricacies of courtly dealings, and shugenja wield the power of elemental magic. Rokugan comes to life through your games, and it comes to life in the accompanying fiction. It also comes to life through the game’s Organized Play—a series of events that direct you to new battlefields, connect you with other samurai, and even allow you to shape the Great Clans and their fates. There are many ways to take part in Legend of the Five Rings: The Card Game Organized Play, but the most basic of them—the foundation—are the leagues, game nights, tournaments, and other events that take place at your Friendly Local Game Store (FLGS). These events help connect you with other local samurai and allow you to train newcomers to your ranks. They provide opportunities for you to clash with the samurai from rival clans, and they're supported by the prizes from the seasonal Stronghold Kits and Reinforcement Kits. Keep reading to learn more about the prizes included in the 2018 Season Two Stronghold Kit. Then you'll be able to get a better view of some of these cards when the developers reveal them during their discussion of the Elemental Cycle on Twitch (www.Twitch.tv/FFGLive), Wednesday, June 13th at 12 PM CT! Each Legend of the Five Rings: The Card Game Stronghold Kit supports three months of in-store play for as many as thirty-two players. If your local Legend of the Five Rings: The Card Game community is larger than thirty-two players, you can talk to your FLGS about supplementing the Stronghold Kit's prizes with the additional prizes in the Season Two Reinforcement Kit. Each Reinforcement Kit supports eight additional players. Once your local group is ready to face the battles and courtly intrigues of Season Two, you can use the Stronghold Kit's contents as prize support for three months of weekly Dynasty League play, three monthly Conflict Tournaments, or a combination of Conflict Tournaments and Dynasty League play. However your Event Organizer structures your seasonal play, you'll find beautiful, full-bleed cards avaialable as participation prizes, and you'll find other extended art cards and arcade tokens awarded to the top finishers and the top representitives from each of the seven Great Clans. To see a complete list of the prizes available—and the recommended prize distribution—you can download the 2018 Season Two Stronghold Kit Event Outline. 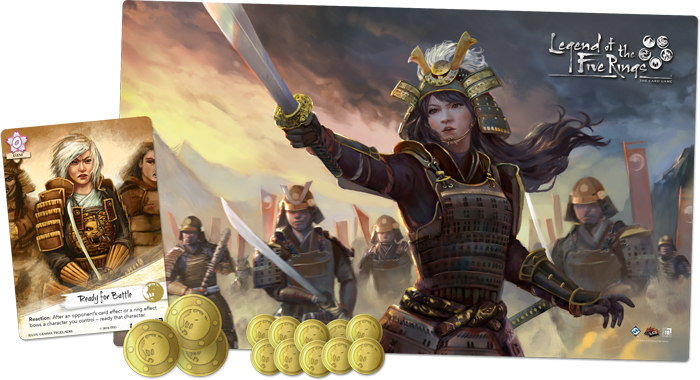 As you read through the 2018 Season Two Stronghold Kit Event Outline, you'll likely note that the kit supports not only three months of Conflict Tournaments or Dynasty Leagues—or a combination of the two—it also supports an additional special tournament: the Shogun Challenge. To honor the Lion Clan's victory at the 2017 Winter Court World Championships, the Season Two Stronghold Challenge features an array of Lion-themed prizes. Each participant in the Stronghold Challenge receives an extended art copy of Ready for Battle. The Top 4 participants in the Stronghold Challenge receive a set of fifteen Lion-themed honor tokens. The winner of the Stronghold Challenge claims a custom playmat featuring the art of Lion commander Ikoma Tsanuri. There are many ways to take part in Legend of the Five Rings: The Card Game Organized Play—and there are more still to come! The in-store events at your FLGS offer you a chance to sharpen your blade and hone your skills. You can benefit from the wisdom of other bushi. You can study the subtleties of courtly manners. You can listen to the kami and experiment with new magic. And you can prepare yourself for the struggles to come. We'll have more information about new Organized Play opportunities in coming weeks. 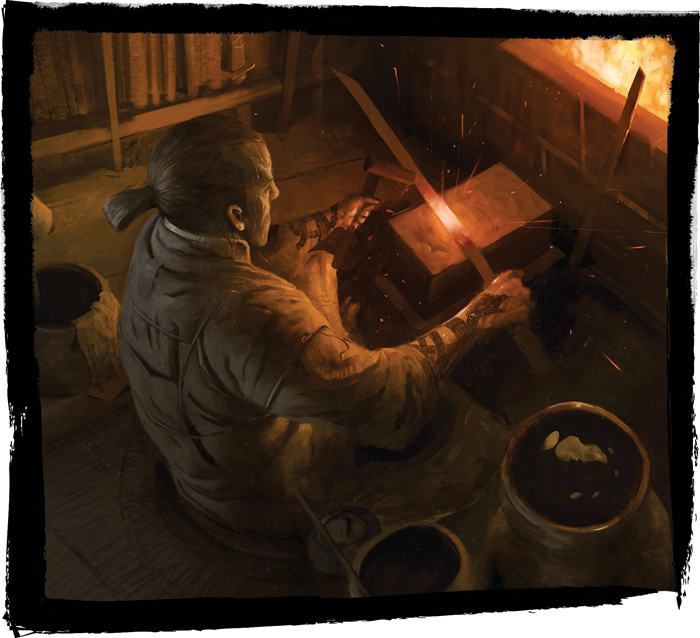 In the meantime, we'll have an article next week from guest writer Tobin Lopes as he looks at growing your local Legend of the Five Rings community, and then on Wednesday, June 13th at 12:00 PM CT, the game's developers will participate in a livestreamed discussion of the Elemental Cycle and Season Two Stronghold Kit. Join us, samurai. The battles and mysteries of Rokugan await you in Legend of the Five Rings: The Card Game Organized Play!